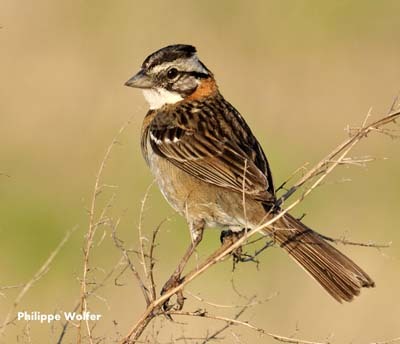 Rufous-collared Sparrow is well known for its voice. 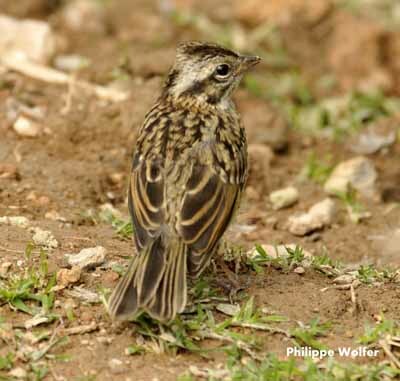 This species lives in large range and there are geographic variations in calls and songs. On the upperparts, we can see a rufous collar on nape and neck sides. Rest of upperparts is brown streaked black on back. Wings and tail are darker brown edged pale buff to rufous. There are two fine white wing bars. On the underparts, throat is white bordered below by black patches on the breast sides. Rest of underparts is pale grey, becoming whitish on belly. Flanks are tinged buffy-brown. On the grey head, we find conspicuous black stripes on crown sides, eye-line and moustache. Crown shows a short crest visible when the bird is excited. The conical pointed bill is grey. Eyes are brown with two white crescents, one above and one below. Legs and feet are pinkish-brown. Juvenile has brown and greyish head pattern. Body plumage is duller. The rufous collar is faint or absent. Underparts are white with fine blackish streaks. There are about 29 subspecies sharing the large range. 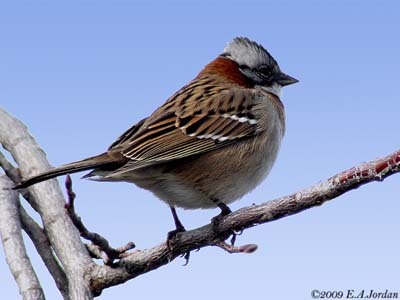 Rufous-collared Sparrow has numerous geographical dialects with some typical and familiar sounds. The male utters one or two long slurred whistles ending sometimes in trill “tee-teooo-eeeee” or “teeeo-teeeee…”. The call includes a metallic “chink” and a sharp “tsip”. The song is two-part with the first phrase as introduction including pure whistles, and the second part is a trill composed of several almost similar sounds. The song is usually uttered from a perch. The duration varies among the different populations. Rufous-collared Sparrow is common in parks and gardens, cultivated areas, open areas with bushes and scattered trees, open and semi-open areas from human habitations to woodlands and grassy clearings with nearby cover. According to the range, this species may frequent semi-open grassy areas in mountains, up to 600 metres of elevation in Costa-Rica, but it may be seen higher, up to 4000 metres in the northern and western parts of the range. 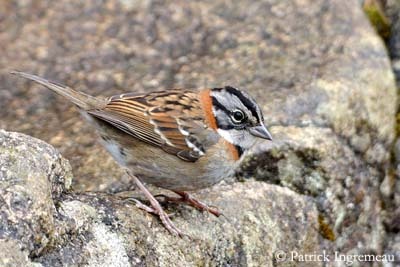 Rufous-collared Sparrow is found from southern Mexico to the southernmost tip of South America, and on the island of Hispaniola. 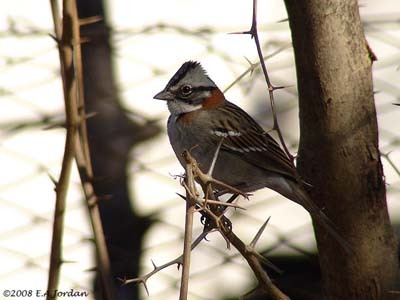 Rufous-collared Sparrow may be seen solitary or in loose flocks. 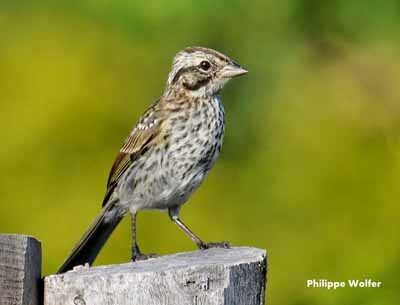 This bird feeds mainly on or near the ground, in bushes and hedgerows throughout the cultivated highlands. It is also common near human habitations. This species feeds on seeds, insects and spiders, and picks termites from the spider webs. 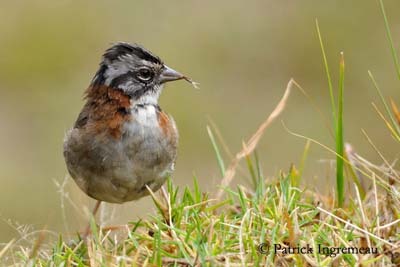 Rufous-collared Sparrow is well known for its voice. It usually sings from a perch such as rock or bush, but in grasslands, it perches on stem-tops and in urban areas it sings from low branches, walls or buildings. Each bird has its favourite perch used repeatedly. 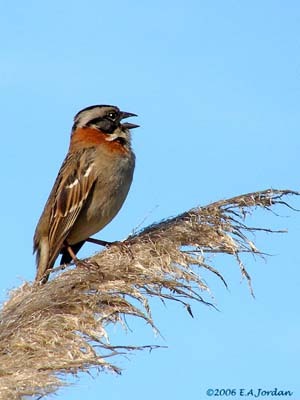 The flight song occurs in migrating groups and is longer and more complex than usual songs. 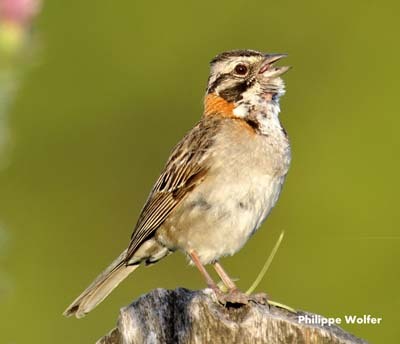 Rufous-collared Sparrow sings also by night. These songs are different and longer. This bird sings strongly near dawn, and almost all day round between September and January. 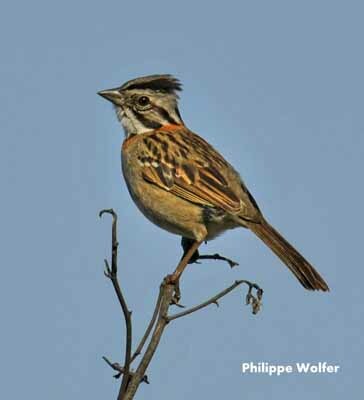 Rufous-collared Sparrow is highly territorial and may attack its own image in mirrors. But usually it is tame and approachable. Pairs hold small territories. This species is non-migratory and endures hard conditions all year round in some parts of the range and especially in the Andes at high elevation. They roost in groups of up to 200 birds in rock crevices to protect themselves against the cold nights. Rufous-collared Sparrow performs fast flight with rapid wing beats. 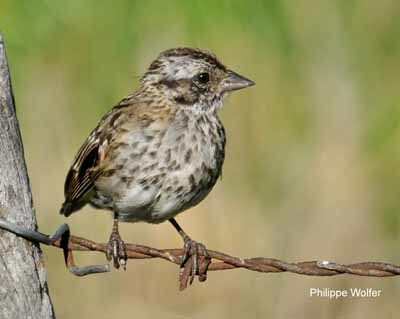 Rufous-collared Sparrow is one of the main hosts of the Shiny Cowbird. In addition, predation is frequent during the incubation period. The breeding season varies according to the range, the food availability and the rainfalls. The bulky nest is situated on the ground or low in vegetation, or in a hole in wall. It is cup-shaped and made with grasses and rootlets, with the interior lined with finer grasses and hair. The nest is built by female in a shallow depression. Female lays 2-3 pale greenish-blue eggs, heavily speckled reddish-brown and grey. Incubation lasts about 12-14 days by female alone. Chicks are fed by both parents and the nesting period lasts between 9 and 11 days. This species produces two broods per season. 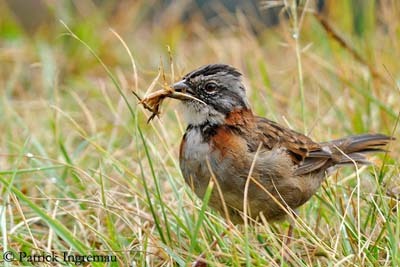 Rufous-collared Sparrow feeds mainly on grass, weed seeds, fallen grain and insects. It forages on the ground or in low vegetation. 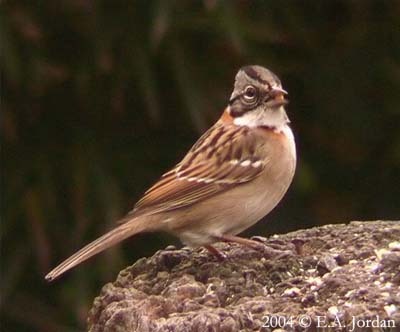 Rufous-collared Sparrow is very common in its large range. The species is not threatened at this moment.